1. Describe the incidence of strawberry pests under low tunnels with a focus on arthropods, pathogens, and weeds. There is currently little research devoted to pest surveys of protected culture crops although this production system is increasing in popularity among growers in the Northeast. By surveying common strawberry pests under low tunnels compared to other production systems, this objective aims to develop new information on pest barriers and challenges of low tunnel systems. Surveys will be conducted on low tunnel, conventional, and organically grown strawberries in central New York, both in research plots and at commercial strawberry farms. We predict that several pests of strawberry respond positively under plastic tunnels such that they reach higher densities on low tunnel strawberry. Past observations indicate that spider mites, slugs, tarnished plant bugs, long-necked seed bugs, creeping perennials, and some pathogens establish well under low tunnels, thus a special focus will be made on these particular pests. Weeds are likely less of an issue, though some species may present specific challenges. Dr. Kerik Cox, an associate professor in plant pathology at Cornell, has agreed to provide guidance on identifying disease incidence and severity as a collaborator on this project. 2. Develop biological control recommendations for two-spotted spider mite (TSSM) that are tailored for low tunnel strawberry systems. 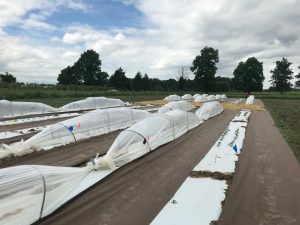 A major concern of strawberry growers is the effect low tunnels have on TSSM, as this species is pesticide resistant and reproduces well under plastic tunnels. A promising alternative for control of TSSM is biological control. Objective 2 is intended to develop specific biocontrol recommendations for TSSM using commercially available predatory mites. Several predatory mite species will be tested on multiple strawberry cultivars under varying plastic types to determine which combination of predatory mite species, strawberry cultivar, and plastic type optimizes TSSM control. Further experiments will be conducted to describe the physical and chemical characteristics of strawberry cultivars to help explain the possible variation in TSSM control. Lastly, varying release rates of predators will be evaluated to determine the optimal number of predators to release according to TSSM density. Results generated from the above objectives will be presented at grower meetings, published in peer-reviewed journals and extension bulletins, and will be developed into instructional YouTube videos to broadly disseminate our findings. Many growers in the Northeast are interested in low tunnel systems to maximize strawberry yields. However, tunnel systems are relatively new to the region and information on pest management is lacking. The purpose of this project is to identify the dominant pests of low tunnel strawberries and to develop tunnel-specific biological control recommendations for the two-spotted spider mite (Tetranychus urticae)(TSSM) which is often problematic under low tunnels. TSSM is a serious pest of strawberry worldwide and is becoming increasingly resistant to chemical control. In addition, this pest appears to reach especially high densities on protected culture strawberry compared to those grown in the open field. This is likely due the hospitable environment created by the low tunnels, but the specific benefit of the plastic (e.g., maintaining warmer temperatures and a higher humidity, or the plastic’s UV blocking capabilities) that positively impacts TSSM is unknown. Understanding why TSSM reaches higher densities under plastic is crucial for building an appropriate pest management plan. In addition, it is important to evaluate how low tunnels impact pest management practices, namely biological control. Furthermore, the effect these tunnels have on pathogens, weeds, and other arthropod pests is largely unknown and warrants investigation. Information on pest barriers and recommendations for management is needed by low tunnel strawberry growers. This project aims to address this by identifying common weeds, pathogens and arthropod pests that are likely to be targets of control under low tunnels, and by developing specific recommendations for management of TSSM. Results generated from this study is intended to provide a foundation on which to build management programs and to provide recommendations on biocontrol of TSSM that supports sustainable agriculture. A day neutral strawberry planting (var. ‘Albion’) was established that included both low tunnel production and open production in the field during 2018 (Fig. 1). Arthropod pests, pathogens, and weeds were monitored throughout the season with a specific emphasis placed on species commonly found on strawberry. A combination of pitfall traps, sticky cards, vacuuming were conducted to describe general arthropod pest abundance while targeted sampling was conducted to monitor for specific strawberry pests. This included baited slug traps, flower tapping (for tarnished plant bug monitoring), and incubating ripe fruit to determine infestation rates of spotted wing drosophila or other fruit pests. Weeds were harvested every two weeks to determine relative weed abundance between open-field and low tunnel grown strawberries, and visual surveys in both systems were conducted to describe pathogen incidence. 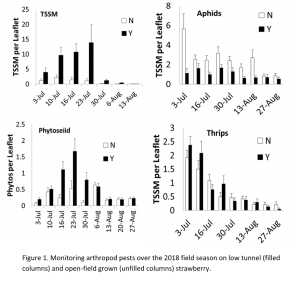 Treatments of predatory mites were applied to low tunnel and open-field grown plots and monitored for their relative efficacy in controlling TSSM. In addition to collecting leaflets from plants to determine TSSM presence and severity, ripe fruit was collected each week to determine any secondary effects of predatory mite treatments on strawberry yield. No pesticides were applied during the above monitoring. Analysis of data is just getting under way as the final week for data collection was the week of November 5th. 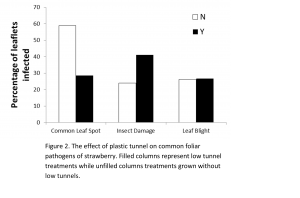 Preliminary findings suggest that most arthropod pests reached higher densities under low tunnels as compared to open plots (Fig. 1). The single exception was aphids, which reached higher densities on open field strawberries. This effect was particularly strong for TSSM and predatory mites. Tarnished plant bug counts (not pictured) reached above threshold densities in both low tunnel and open field systems. Tunnels appeared to repress common leaf spot prevalence on strawberry leaves, while there was more insect damage on low tunnel strawberries and no effect on leaf blight infestation (Fig. 2). Comparison of TSSM control by beneficial mite treatments (1) N. fallacis, 2) P. persimilis, 3) N. fallacis + P. persimilis combined, and 4) no mites) revealed a little difference between the predator species (Fig. 4; p = 0.58 indicated by a generalized mixed-effects model), although treatment 1 and 3 resulted in the lowest TSSM density. There was also no effect of beneficial mite treatment on strawberry yield (Fig. 5). Future efforts relating to this research include pest surveys at commercial operations in NYS during 2019. A minimum of 8 farms will be selected that implement low tunnel production of strawberries. Predatory mite treatments will be applied at these farms and monitored for their relative efficacy in controlling TSSM. Lab, greenhouse, and field studies will also be conducted to determine the impact of strawberry cultivar and plastic type on TSSM population dynamics and predatory retention/efficacy. This research was presented at the 2018 Great Lakes Fruit Workers Meeting in Ithaca, NY and at the 2018 annual Entomological Society of America meeting in Vancouver, BC. Development of instructional videos on implementing low tunnel strawberries and recommended biocontrol practices will begin during Spring semester 2019. In addition, surveys to identify candidate farms for 2019 field research will be distributed during this time. So far, we have amassed a list of potential growers in the central New York region that will receive the survey. Results of this project will proved needed information on pest incidence and severity on protected culture strawberry, an important crop in NY and across the Northeast. This information contributes to sustainability by providing the foundation on which management programs can be built from. Growers will know which pests to prepare for, and thus can plan accordingly. By limiting pest control efforts to a few target pests, growers can save resources and better protect their investment in low tunnel production systems. In addition, a major goal of this project is to develop recommendations for biological control of TSSM, a devastating pest of protected culture strawberry. Alternative options for management of TSSM are needed, especially it becomes increasingly resistant to pesticides; however, current options for biological control have variable success. 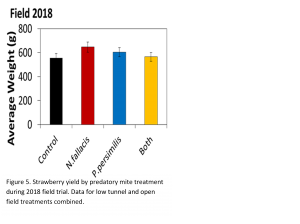 By tailoring current options in biocontrol to low tunnel strawberry, this project hopes to reduce the variability of biocontrol success and reduce grower reliance on pesticide use. We have learned a great deal about sustainable production of strawberries in the Northeastern U.S. while conducting research for this project. We have specifically come to realize the great difficulty in conducting biological control experiments in the field with small pest targets, such as herbivorous mites. We hypothesize that the lack of success of predatory mites in controlling TSSM in the field was the high rate of predator dispersal from our strawberry plants, thus we will conduct further experiments to address this. High predator retention is a crucial component of successful biological control. 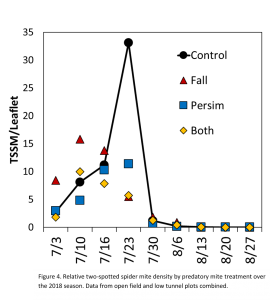 There are many factors influencing predator retention in the field, and for predatory mites, host plants appear to have a strong effect. Thus, we will conduct similar experiments as in 2018 but on several strawberry cultivars in the field during 2019. In addition, we will also test the effect of plastic type commonly used for low tunnels on TSSM population dynamics and predator retention. Finally, we have become increasingly appreciative of the efforts growers and researchers make to better improve sustainable agricultural practices. After conducting pest surveys in the field to describe pest incidence on strawberry, we are now more aware of the immense pest pressure that occurs when pesticides are not used in a management program. Thus, we are even more motivated to solve this issue by further developing management practices that promote sustainability and responsible pest management.